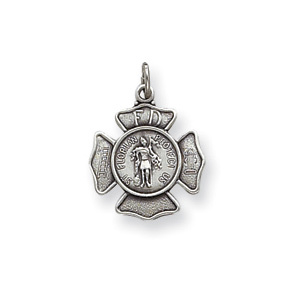 This small sterling silver St Florian badge medal charm has a satin and antique finish. 5/8 inch tall by 5/8 inch wide without bail. This item is smaller than a dime. St. Florian is the patron saint of firefighters, brewers, Poland and Austria. Weight: 1.59 grams. Made in the USA.